Training as a medical assistant (MA) at Northwest allows you to join a career path filled with personal satisfaction and genuine opportunities for you to make a positive impact on other people’s lives. 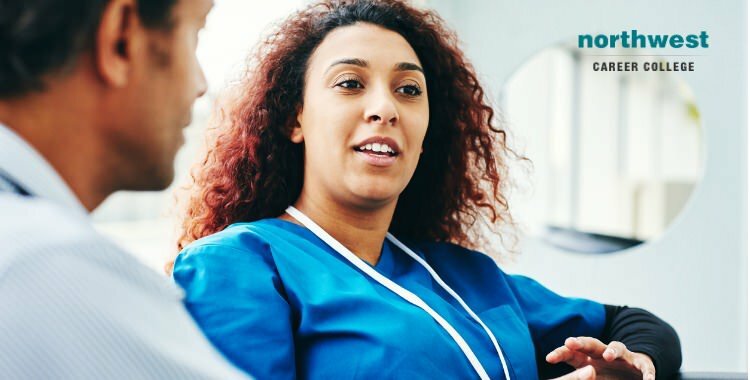 That being said, making big career changes can be a risk, especially if you have a family to support, so if you are thinking about training as a medical assistant, we’ve put together some excellent reasons why now is the best time to take that big step. The healthcare industry in the US is booming, and as it grows there are more and more medical assistant job roles becoming available. Job prospects for medical assistants are projected to rise by 29% over the next ten years, according to the U.S. Bureau of Labor Statistics. The reason for this growth is the US’s aging population, many of whom are now requiring increased medical attention as they age. In order to keep costs low, many medical facilities are expanding the number of medical assistants on their staff and expanding the range of responsibilities and opportunities available to those MAs. One of the largest benefits of choosing a career in medical assisting is that the job is rapidly accessible. This is especially true in comparison to medical careers that can take years to earn the correct qualifications. Here at Northwest, you can graduate as a qualified MA in as little as nine months andNorthwest’s schedule allows you to attend medical assisting training, care for family and have a balanced life in Las Vegas while advancing towards your new career. Aspiring medical assistants have the option to take the Certified Medical Assistant (CMA) exam. While this test does require a deep and wide-ranging understanding of healthcare implementation, and will probably invoice studying for extended periods of time, everything you learned while revising for you CMA will end up proving to be incredibly useful in getting you your first job and in helping you advance your career. Passing the CMA exam earns participants a set of credentials that are accredited by the American Association of Medical Assistants (AAMA), which is a great thing to advertise on your resume. These credential aren’t required by all employers and they aren’t necessary for all states but having your CMA accreditation has the potential to increase your attractiveness to potential employers and increase the number of roles open to you. Medical assistants are the beating heart of most healthcare providers, meaning that there is a huge range of facilities and settings in which you can find work. If you enjoy variety, are unsure of exactly where you want to grow your career, or want to stay flexible so you can pursue other career opportunities, working as a medical assistant gives you a wide range of options to choose from. According to the v, more than half of all MAs are employed in physician’s offices or clinics. Other common settings include hospitals, offices of health practitioners and outpatient care centers. Training as a medical assistant opens up the opportunities for working a range of settings such as hospitals, clinics, private practices, or in ambulatory care. As noted in the Bureau of Labor Statistics surveys, most MAs work in medical clinics, which are typically only open during standard business hours. This is ideal if you have a family and need to work a predictable work schedule. Qualifying as an MA mean you can work predictable hours, leaving plenty of opportunities to enjoy that all-important family time. If working shift hours appeals to you, then becoming a medical assistant at a hospital is an option you may consider pursuing. Working at a hospital gives you the option of working full-time or part-time hours, depending on your preferences, and you can generally pick shifts that best suit your lifestyle.